This present study aims to explore how to incorporate values of moderate Islam for the 21st century learners in an EFL class. This research was conducted in the single class consisting of 44 undergraduate students who took English for Islamic Education course at Institut Agama Islam Negeri Pekalongan. The data were collected through observation and interview. The finding has revealed that five values of moderate Islam could be noticed in the EFL class, namely: 1) objectivity, 2) tolerance in encountering diversity, 3) inclusiveness in receiving something new, 4) logic and flexibility in understanding texts, and 5) innovation in daily life. Another result demonstrates the lecturer’s pivotal roles in incorporating the values of moderate Islamic for the 21st century learners in the EFL class, including 1) facilitating as a good model to incorporate the values such as respecting diversity without any discrimination of gender and social backgrounds, respecting diversity in the learners’ responses, and having enthusiasm for helping the learners, 2) organizing an online group on Edmodo learning management system, and 3) providing the EFL learners with opportunities for enhancing good morality in both individual and group learning activities. Meanwhile, relating to the use of learning materials, online news articles containing Islamic values were used as the authentic materials, and EFL teaching may impact on the learners’ disappointment or conflict with the culture embedded in the learning materials. ALI, Fachri. Incorporating Values of Moderate Islam for the 21st Century Learners in an EFL Class. Edukasia Islamika: Jurnal Pendidikan Islam, [S.l. ], v. 3, n. 1, p. 20-32, june 2018. ISSN 2548-5822. 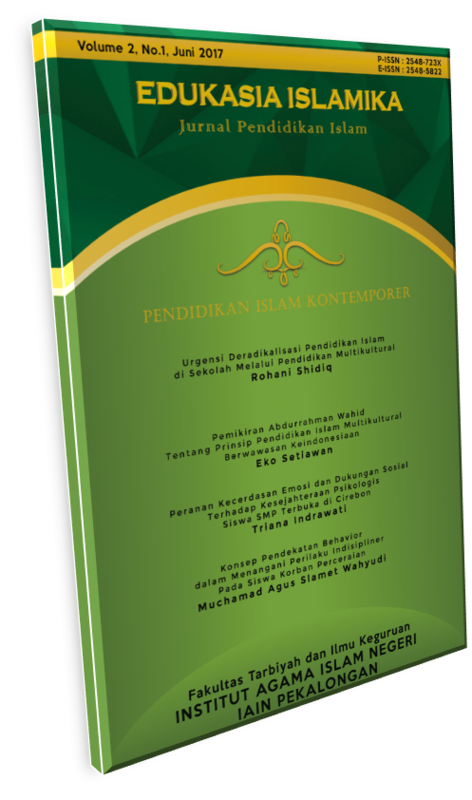 Available at: <http://e-journal.iainpekalongan.ac.id/index.php/edukasiaislamika/article/view/1299>. Date accessed: 22 apr. 2019. doi: https://doi.org/10.28918/jei.v3i1.1299.